I wanted to share a simple tool I made yesterday for those who may find it helpful. I have an issue with saying yes to too much and not always being aware of my calendar when doing so. This results in long stretches when I have very little “down time” between planned events or other necessary activities. I have a lot of interests and am always really excited to pursue them and might not notice until it’s too late that I’ve been doing too much. Down time is important to my well-being as it is how I recharge. Some people recharge by being out among people. I need time alone (with the exception of my husband, usually) in order to re-fuel. For me, the most effective recharge time is a half-day block of unplanned free time. I might be able to get by with an couple of hours, but I really need those larger blocks on a regular frequency. So, I created a very simple, high-level calendar to help me track my commitments and visually asses when I’m approaching the threshold of “too much”. Each day is divided into halves. If I have any commitments, I’ll fill in the halves with either a yellow or blue fill. If I can see that I’m about to that threshold of “too much”, I’ll go head and fill the remaining open time as grey, noting to myself that I shouldn’t commit to anything else in those block of time, lest I run the risk of wearing myself out. 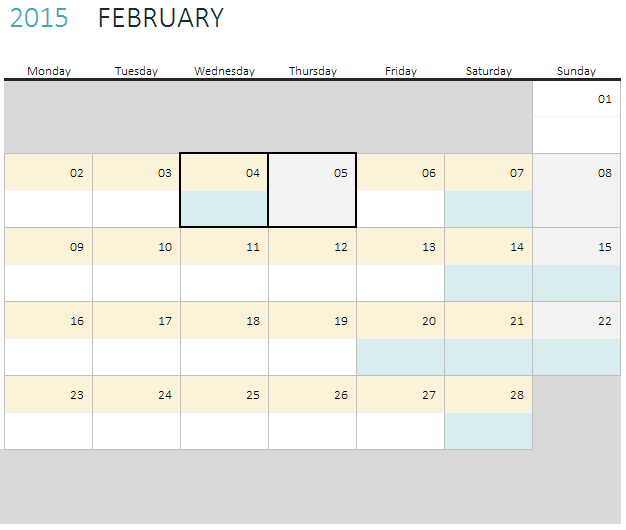 February is commonly a busy month for me, and you can see how I have it set up, currently. I have all my workdays blocked off. I have plans the evening of 2/20 as well as every Saturday in the month. I am taking the 4th and 5th off of work (thus the bold outlines – just helping me track my work vacation usage as an added bonus). I have plans to spend my birthday at Disneyland, so it’s filled in. I’m purposely blocking off the 5th to have no plans and just be a “me day” as a gift to myself. Given that my Saturdays (and some Sundays) are already filled with plans, I’ve blocked off the remaining free time with grey fill to remind me not to schedule anything during those times. I don’t have much planned in late January, so I’m still currently fine with something being panned on 2/1 (maybe attend a Superbowl Party) should it come up. Not all allocated activity/event time is created equal and I may adjust some coloring to account for this. For example, I get a monthly massage. I’m marking that as grey – like blocked “me” time – because while it takes time and effort to go do, the ultimate end-state is some almost meditative time and me feeling relaxed and refreshed. That activity counts more as a refresh than against it. I also have one week at work that is almost always VERY stressful. I’ve marked that with a darker orange fill. I’m not quite ready to block off the evenings or prior/post weekends in grey, but it’s a small indicator that I need to be very careful when committing to events around that week. If you suffer from some of the same issues, feel free to download and use my template and adjust for your needs. My Christmas gift to introverts with many interests!